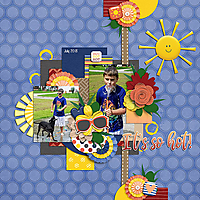 I love the fun elements, especially the sun, and the blue background! I love how you divided the page with the brown ribbon and then loaded the left side with pictures and elements -- it's a really nicely composed layout. Beautiful clusters and stacking.